Mrs. S Singh, assumed the responsibility as Director of Goodley Public School after relinquishing the post of Principal on 1st Jan, 2009 to oversee the continuous development of the school while maintaining quality of education through her enriched experience of teaching for more than 25 years on her credit which includes 25 years as the Principal of GPS. 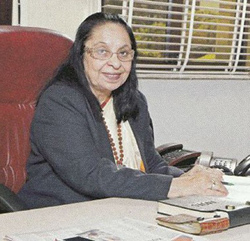 She joined the institution as vice-principal, thereafter became the founder Principal. She created an environment where intellectual development strives to promote traditional Indian values with due emphasis on competence, creativity and inculcation of scientific temper and aesthetic appreciation. Cultivation of patriotic outlook, promotion of our cultural heritage, discharge of social obligation and unflinching commitment to the unity and integrity of the country forms the essence of her philosophy. Her valuable contribution in the field of education, brought honour to the school when she was awarded with the prestigious PTA National Award by Lt. General Surinder Nath, Chairman, UPSC. She was also honoured by the prestigious Dr. Radha krishanan award for her exemplary contribution in the field of education. She has not only been the source of inspiration for the students but also for the staff members who under her guidance are scaling new heights of success. As Director of Goodley Public School, Mrs. S Singh actively looks after the administration of school, to maintain its excellence in academics through her unmatched discipline oriented approach towards the students.